Whether you have an ABS-equipped motorcycle or not, it's always a good idea to practice quick stops regularly on your bike to keep your skills sharp in case you need them during an emergency situation. Think about your front brake lever as a large lemon — to get all the juice out of your lemon you don't crush it but you squeeze it firmly and progressively. If, by the time you're fully stopped, you feel there is still juice in the lemon, it means you didn't squeeze your lever hard enough through the end. Find a safe place to practice and try to achieve max-squeeze quicker each time. The goal is to achieve maximum braking power through the entire stopping procedure, not only at the very end. If you lose traction on the front tire, it means you were too abrupt — no biggie (seriously), just release it quickly and reapply. If you are going on a straight line you won't fall unless you keep skidding for too long. Again, just release and reapply. By the way, you don't need to do a stoppie, but if you do it means you achieved max braking — at least during the last part of your stopping procedure. Keep in mind that the rear brake on a motorcycle only carries so much of the braking power, especially when all the weight of the bike is being transfered forward during max-braking, so be very gentle on your rear brake at first and release it as the weight transfers forward to avoid a rear wheel skid — the less weight you have on your rear wheel, the less traction you will have too. If the rear tire starts skidding, release the rear brake very slowly to avoid a high side, then you can reapply if needed. Note: If you lose traction on the rear and you start fishtailing, you can keep it locked until you come to a stop but you won't be able to steer the bike in case you need to avoid an obstacle. Whether or not try to recover your rear traction is something you will have to assess on the spot but it's always good to know how to do it. Now go and find an empty street or parking lot and practice those braking skills. I recommend you start slow, at 10 or 15 MPH and build up your speed and technique from there. 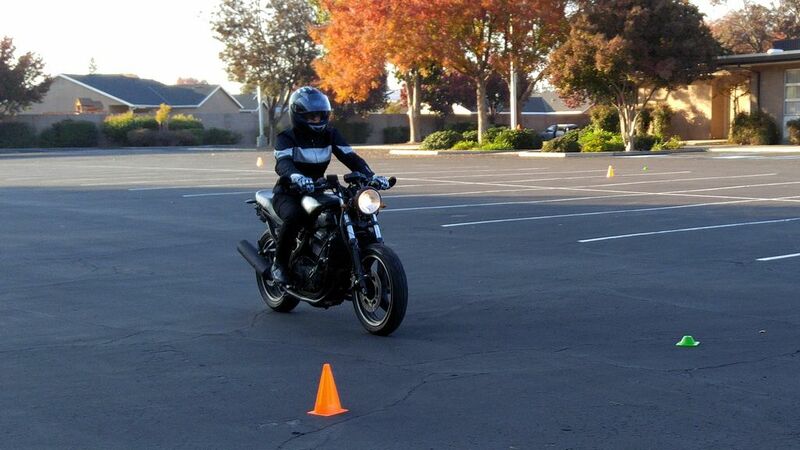 Remember that quick, maximum braking on a motorcycle can only be achieved when you are going in a straight line so, if you are in the middle of a turn, make sure you straighten up the bike first and then apply the maximum braking technique described above. Oh, and keep your eyes up! If you look down you may hit the ground. Be wise, get trained, ride safe.